Though Apple failed to unveil hotly anticipated MacBook, iPad and iPhone refreshes at its Worldwide Developers Conference keynote, the company did debut new hardware on Monday in the form of additional color options for its silicone iPhone case and Apple Watch band lineups. Available for order now through Apple's online storefront are three new color choices for the company's iPhone 8 and iPhone X silicone cases, and matching Apple Watch Sport Band options. Like previous summer releases, the new colors — peach, marine green and sky blue — are light pastels that balance out darker tones issued during the fall months. Apple typically presents seasonal hues for device owners who like to rotate their accessories. 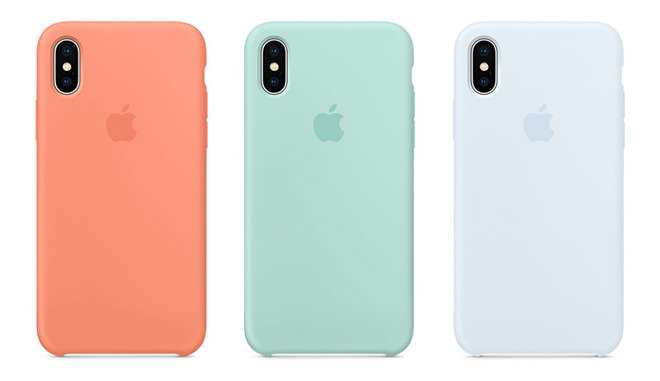 Pricing is identical to normal variations, with iPhone X and iPhone 8 Plus/7 Plus silicone cases selling for $39 and iPhone 8/7 cases priced at $35. Each of the three colors are also available on 38mm and 42mm Apple Watch Sport Bands for $49. While Apple failed to mention the new accessory colors onstage at WWDC, it did make note of a special Pride Edition Apple Watch nylon band that is being sold for LGBTQ Pride Month. The woven nylon strap features a rainbow stripe design on a white background. A portion of Pride Edition band proceeds will go to LGBTQ advocacy organizations including GLSEN, PFLAG, The Trevor Project, Gender Spectrum, The National Center for Transgender Equality in the U.S. and ILGA. The new cases and bands arrive on the heels of Apple's WWDC keynote address, where the company outlined its software ambitions for 2018. Customers can expect a litany of new features when iOS 12, macOS Mojave, watchOS 5 and tvOS 12 see release later this fall.